You may have read my article in the travel section of Austin American-Statesman on Sunday, April 10 about buying a hand-made Turkish rug during a visit to Istanbul. Since my decorating style tends to be more contemporary, I had no intention of purchasing a traditional rug with an intricate pattern, but I was drawn in by the workmanship and beauty of individual pieces and purchased a small runner for the entry of my home. 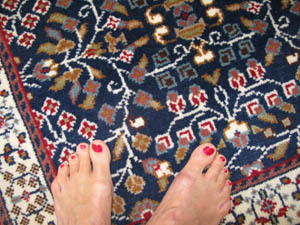 Recently I received a call from an employee of Hereke, the place in Istanbul where I bought the rug. Representatives of the company were in Austin calling on previous customers of the Istanbul store (Amazingly, they had a list of more than 150 names). Would I be interested in seeing some of their rugs? While I love the piece I purchased, there didn’t seem to be a good place for another rug in my home. But I couldn’t resist the opportunity to look, especially since they were bringing the selection to me. (Yes, those Turkish rug guys know how to set up for a sale). As a result, I now have three Turkish rugs—my two new carpets are much larger and even more beautiful than the small runner I started with. 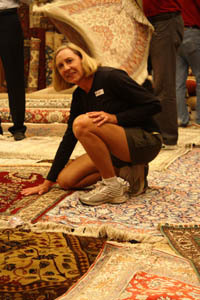 I also learned more about Turkish rugs and gained greater appreciation for these pieces. The runner I originally bought is from Hereke, a unique weaving center located southeast of Istanbul. The village is recognized for producing the finest hand-knotted carpets in the world; the Imperial factory established there in 1843 supplied rugs for sultans’ palaces. Hereke carpets are woven in either pure silk or cotton and wool (as mine is) and double knotted, so the knots cannot be undone or removed, making the rug more durable. The number of knots per square centimeter is an important criterion in determining the quality of a carpet, and Hereke carpets are among the best. The knots are tightly squeezed together using an iron comb once each knotted row is completed on the loom, which increases density and strength of the carpet. That’s just a small part of the process that often requires years of skilled labor to complete. Because it takes so long to train weavers, they cannot easily be relieved of their duties during economic slumps nor replaced when business picks up. In an effort to keep its 17 loom locations busy and productive, representatives traveled to the States with a large truckload of carpets. Murat, our Turkish rug guy, had a large Hereke carpet with the same Flowers of the Fields design featured in my runner.Still, the pattern and colors are unique to that specific rug. And it fits perfectly under my dining table. Then there’s my favorite, the thick and luxurious rug from Kayseri, also known for its quality carpets. The moment I saw it, I was smitten. The weave is exceptionally tight and the pile thicker (the Ferrari of rugs, according to Murat). Since Kayseri is located on the once-famous Silk Road trade route, rugs from this region offer great variety of designs and color combinations. Rugs from Kayseri, which is considered the second most famous rug center in Turkey after Hereke, are also found in palaces. It’s good to know I’m walking on carpets fit for royalty.